Today, the site of the Pearre depot is the western terminus of the Western Maryland Rail Trail, a restored section of track that roughly parallels the towpath back to Big Pool. Many locals bike what they call the “bow-tie,” which utilizes both the Rail Trail and the towpath for 40+ mile round-trip. 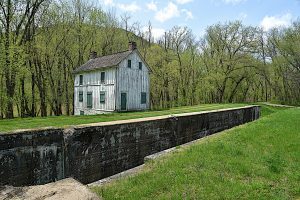 Bikers can experience the history and terrain of both the towpath and the restored railroad bed.